Whether you are a hard-core mountain biker, an adventurous historian, or just someone who likes to explore *truly* off the beaten path, here is an experience that will live with you forever. Take a wild guess at where this picture is from. Would you have ever guessed Haiti – literally “Land of Mountains.” It is one of the least explored countries in the western hemisphere, and offers thousands of miles of epic trails for hiking, climbing and mountain biking. Through our partnership with Extreme Bike, we can offer fully inclusive tour packages. 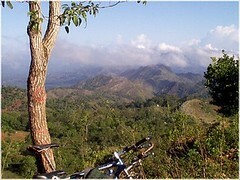 Click on facebook.com/MountainBikeHaiti to join Haiti with a new chapter in sustainable adventure tourism. Architecture – Plan Calls for Rebuilding Haiti Away From Port-au-Prince – NYTimes.com. And on the floor above Mr. Dobrianskiy’s casino, a nightclub called Barak, with blaring music and Miami-priced cocktails, caters to a different elite here: United Nationsemployees and foreigners working for aid groups. They mingle with dozens of suggestively clad Haitian women and a few moneyed Haitian men taking in the scene. I am very honored to have been part of the early stages of the operation in Haiti, and it is inspiring to see how expansive the operation has become in a matter of a few weeks. It’s been 30 days of Project Leogane, and we’re off to a running start! Check out this brief video recapping our first month of programs, as well as our Haiti photo collection on flickr. Here’s a quick look at what we’ve been working on and how we’ve ramped up. In one month, we’ve cleared over 30 slabs! Land is extremely limited in the urban/semi-urban areas most affected by the earthquake, so each home that we clear is a chance at a fresh beginning, a jumpstart to the rebuilding process. Our volunteers have thrown themselves into the work, sledge hammering concrete roofs and columns, hack sawing twisted rebar, and pushing loaded wheelbarrows. Also emerging from the rubble are the stories of each family who lived there; they’ve worked alongside us to clean up, salvage what they can, and begin rebuilding. Special thanks to the kids of Leogane who work cheerfully and energetically with our teams each day! Their attention to safety is rewarded with a wheelbarrow ride through the neighborhood. The Canadian army has also been a tremendous asset to the city of Leogane with their heavy equipment and can-do attitude. Once HODR teams fill the streets with rubble, they arrive to truck the debris away. read more here -> Hands On Disaster Response. The 63-page ebook is aimed at introducing travellers to the wonders of volunteering abroad and to help them break away from the usual backpacker trail, get involved with local communities around the world and make a difference in people’s lives in a variety of ways. Help deciding whether international volunteering is a good fit for you. Advice on how to choose a volunteering experience that is right for you. Information on different types of volunteering from conservation to development to disaster relief. Practical information on visas, travel insurance, packing, health and hygiene, living conditions and communication. Nine interviews with international volunteers sharing their experiences, giving advice and offering inspiration. Tips for how to find free and cheap volunteering placements including website reviews that will help with your search. A list of volunteering opportunities worldwide that are free or low-cost with organizations I trust. Fee-based volunteering: Why I would never do it but why it is right for some people. A list of fee-based volunteering companies along with information on whether they donate part of their fee to the actual project. Free updates forever as I discover new free and cheap volunteering opportunities and make other updates. Nerdy Nomad » The Underground Guide to International Volunteering.